What is the most common method of postpartum sterilization? Postpartum sterilization is sterilization performed after the birth of a baby. The method used most often for postpartum sterilization is called tubal ligation. 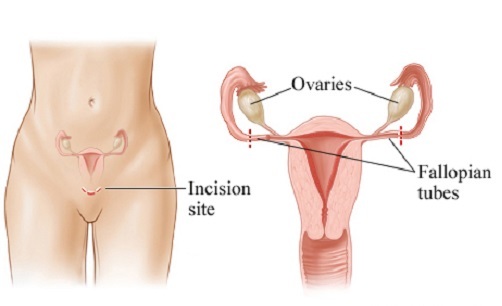 For women who have had a vaginal delivery, a small incision is made in the abdomen (a procedure called mini-laparotomy). For women who have had a cesarean delivery, postpartum tubal ligation can be done through the same abdominal incision that was made for delivery of the baby. If you have abdominal pain that does not go away after a few days, if the pain is severe, or if you have a fever, contact your health care provider right away. 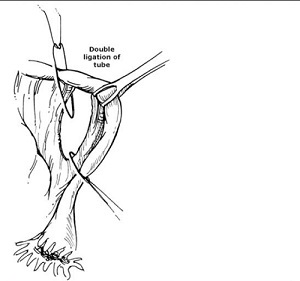 Mini-laparotomy: A small abdominal incision used for a sterilization procedure, in which the fallopian tubes are closed off.